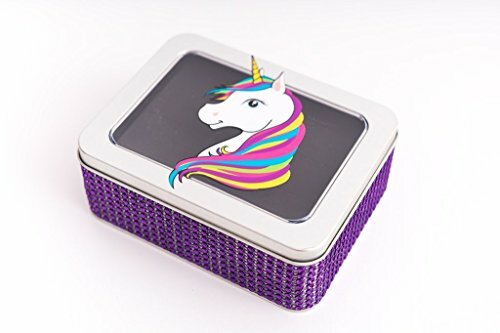 This Unicorn Earring Box is perfect for all girls who are dreamy about Unicorns. It sparkles with delight with the Purple Jeweled Ribbon and is the perfect size to secure and store your stud earrings when traveling or just to put in a drawer or display on your dresser. The custom foam insert inside is designed to securely hold your post/stud earrings in place WITH THE BACKS ON. Just simply insert your earring into the pre-cut slots. ** The EXTRA INSERT allows you to hold more earrings/rings. It will sit loosely on top of the bottom layer of jewelry and is small enough to lift in and out of the tin. You will never lose the earrings and they won't move during travel. This works perfect to hold and store your rings in too. It has a hinged, clear top lid so you can see inside from the top with a Vinyl Unicorn Sticker. It has 8 precut lines on the bottom layer with 6 precut lines in the extra insert piece. With both pieces, you can easily store 60 small pairs of earrings, but this can be less depending on the size of earrings you have and how many rings you use. * I also make this with Hot Pink, Turquoise, Silver and Light Pink Jeweled Color Ribbons. * Earrings and rings in picture are not included. I am always creating new and exciting products to help you organize your jewelry. * I guarantee you will LOVE this product. It will simplify and organize your life.